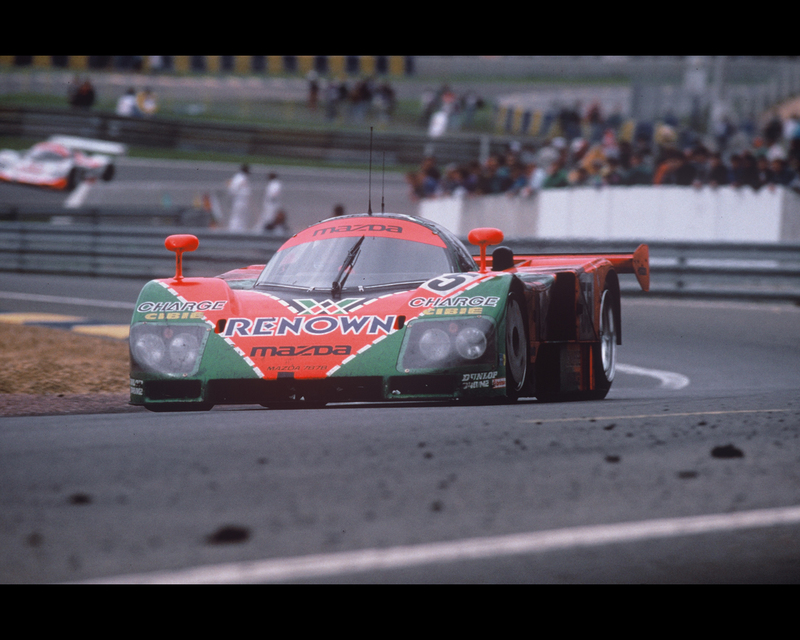 Mazda, in 1991, became the first Japanese automaker to win the 24 Hours Le Mans endurance race. They were well-prepared, had taken the development from the aluminium to carbon-fibre chassis and from the good old triple rotary piston engine to the 750 hp four rotor unit. They had also signed up the great Jacky Ickx, not only as figure-head but as an expert whose advices were taken very seriously. Nevertheless, the Match of the Year 1991 was presumably between Mercedes and Jaguar with additional spice thrown in from Porsche and Peugeot. The rotary piston engine Mazda was the clear outsider. Not least because the rotary piston engine had to last the 24 Hour duration using the same amount of fuel (2.550 litres for 24 hours) as its reciprocating piston engine rivals, who in turn had no idea that Mazda had found a solution to minimize the thirst of its rotary piston engine. There were two new 787B cars. In one sat Sweden Grand Prix driver Stefan Johansson, Ireland's David Kennedy and the Brazilian Maurizio Sandro Sala. 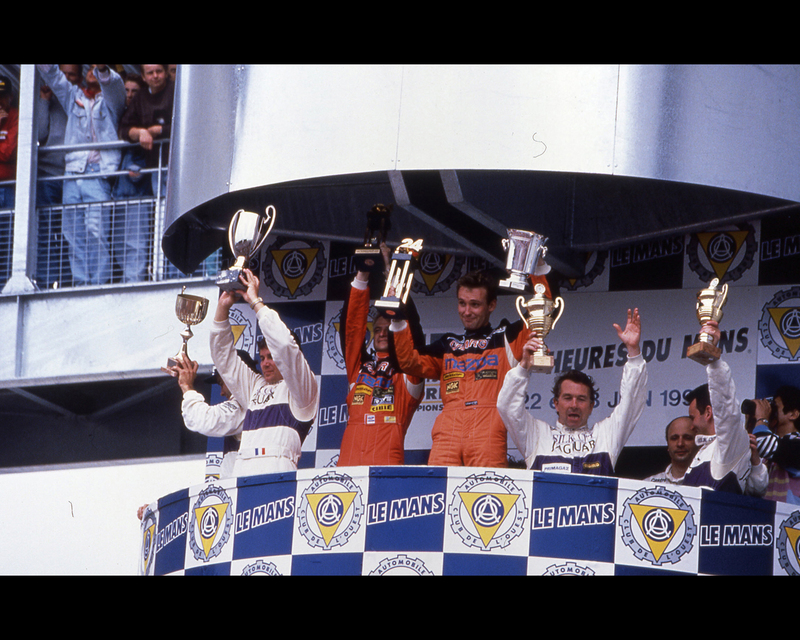 The second trio were Volker Weidler from Germany, Johnny Herbert from Britain and Belgium's Bertrand Gachot. Yorino and Terada from Japan manned the car from the previous year (a 787 without the B) with Belgian Dieudonné. 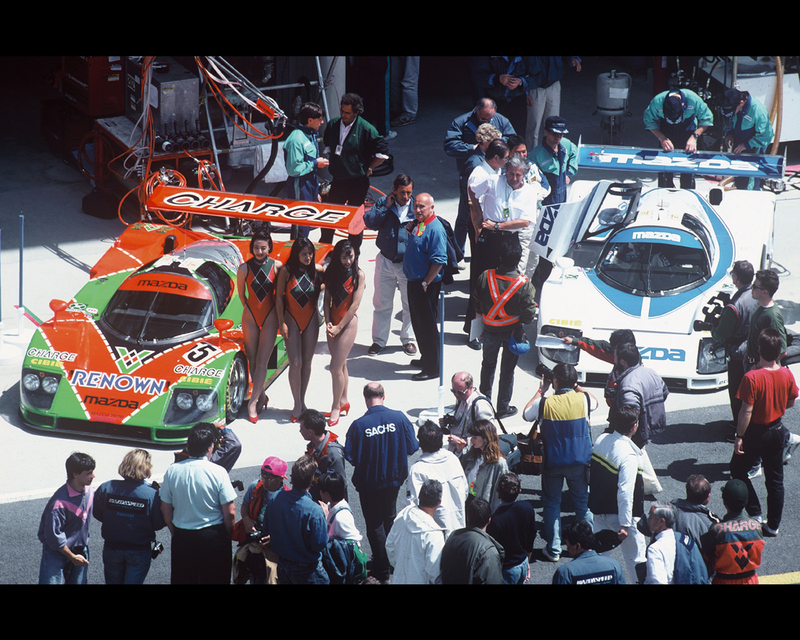 As the dust settled after the first hours, the N°55 Mazda (Herbert & Co) was sandwiched between a Mercedes and a Jaguar, with the two other Mazdas romping happily at la Sarthe. The Mazda pilots had received a rev limit of 9.000 rpm and on the longest straights they even lifted the throttle at 8.000 rpm. " That was the only restriction we had to save fuel," reminded Volker Weidler, " but the car was so robust that we hit the brakes at the very last point and threw it brutally around the corners." The sound was a call to battle. 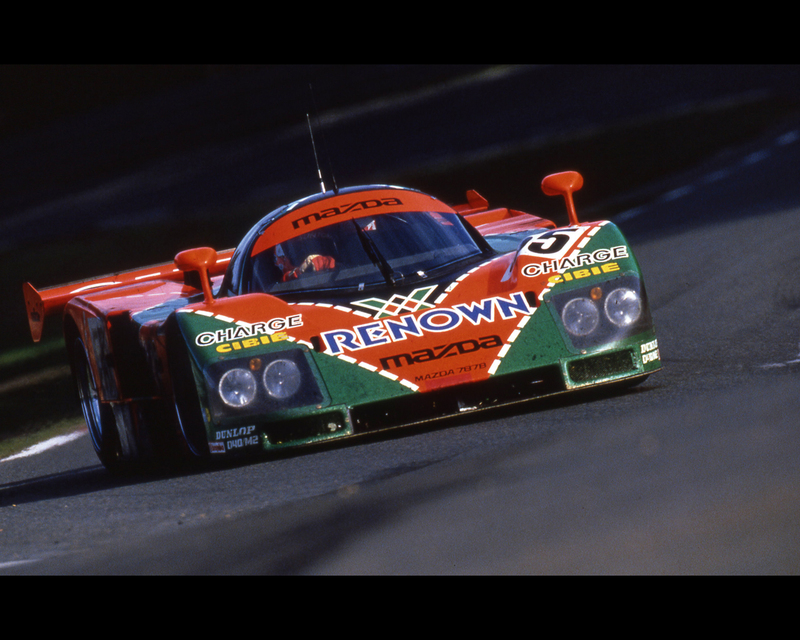 Those who heard the Mazda in 1991 have never forgotten it. On Sunday morning the Mazda boys increased the pressure. " Somehow," says Johnny Herbert, " we had a feeling that this car could take it all, so we drove like we were in a sprint race." Two hours before the flag the Mazda ripped along the finish straight, and whipped past a Mercedes which had steam pouring out of it. Johnny Herbert finished a historic and immaculate race for Mazda with 362 laps equivalent to 4.923,2 km at an average 205,333 kph. 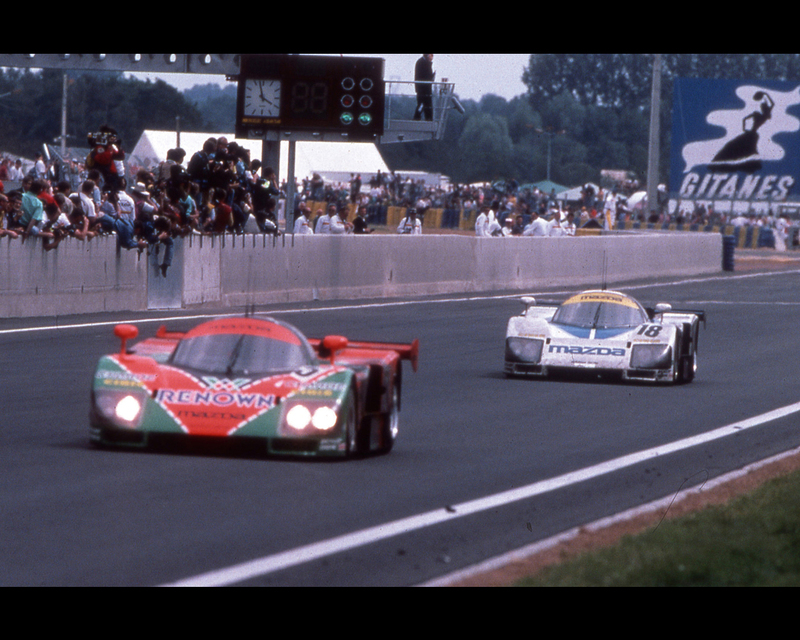 The Mazda Group C prototype with four rotor rotary engine weighed 830 kg. 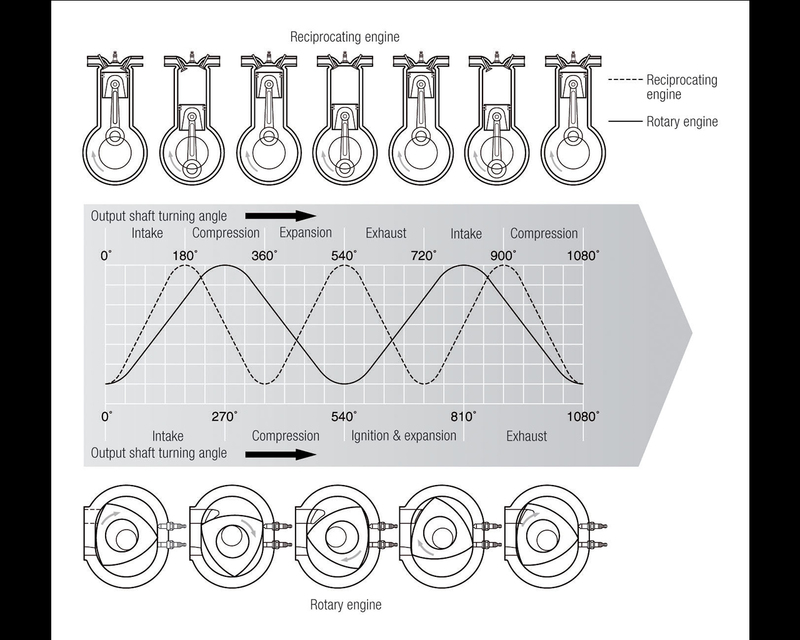 STRUCTURE and WORKING PRINCIPLES of the ROTARY PISTON ENGINE - Over the past 200 years, many inventors and engineers have pursued the idea of developing a continuously rotating internal combustion engine. It was hoped that the reciprocating piston internal combustion engine would be superseded by an elegant prime mover bearing a closer resemblance to the "wheel", one of mankind's greatest inventions. Dr. Felix Wankel developed the Wankel-type rotary piston engine in 1957. Dr. Wankel had researched and analyzed possibilities of various types of rotary engines and reached the optimum shape of the trochoid housing. His deep knowledge of the rotary valves used for aircraft engines, the airtight sealing mechanism for superchargers and the incorporation of these mechanisms into his design contributed to practical realization of the Wankel rotary piston engine. The rotary piston engine is composed of a cocoon-shaped housing and a triangular-shaped rotor inside it. The space between the rotor and the housing wall provides the chamber for internal combustion and the pressure of expanding gases serves to turn the rotor. In order to make the rotary piston engine work as an internal combustion engine, the four processes of intake, compression, combustion-expansion and exhaust had to be performed in succession in the working chamber. Suppose that the triangular-shaped rotor were concentrally placed inside a true circular housing. In this case, the working chamber would not vary in volume as the rotor turned inside the housing. Even if the fuel-air mixture were ignited there, the expansion pressure of combustion gas would merely work toward the center of the rotor and would not result in rotation. 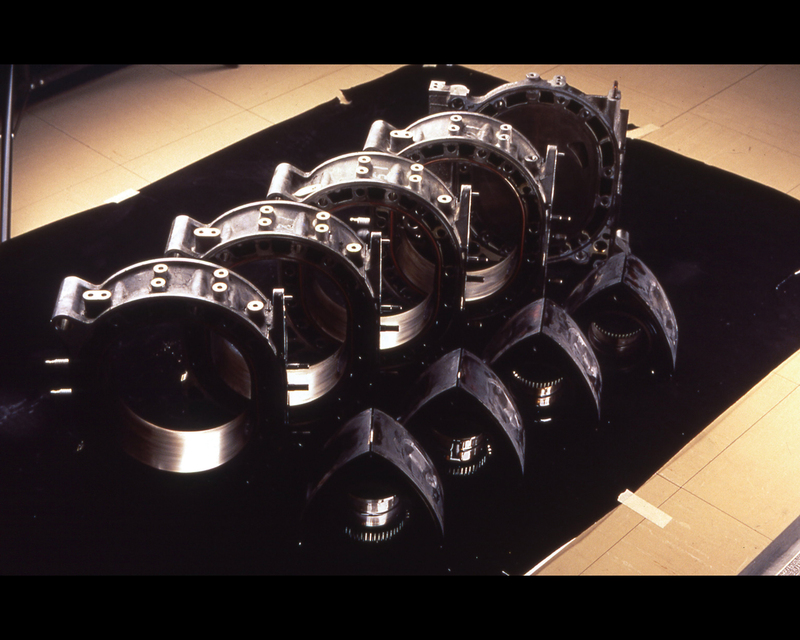 That was why the inner periphery of the housing was contoured as a trochoid-shape and assembled with the rotor installed on an eccentric shaft. The working chamber changes in volume twice per revolution, thus the four processes of the internal combustion engine could be achieved. With the Wankel-type rotary engine, the rotor's apices (edge seal of the rotor) follow the oval contour of the inner periphery of the engine casing while remaining in contact with the gear on the output shaft which is also on an eccentric orbit around the center point of the engine casing. A phase gear mechanism dictates the orbit of the triangular rotor. Several automakers in the 1960s worked under Wankel license to develop there version of the rotary piston engine. The rotary piston main advantages were all rotating parts, light weight and reduced proportional volume. The main drawback was difficult chamber sealing performance, relatively high fuel consumption and hence rather high pollutant emission. 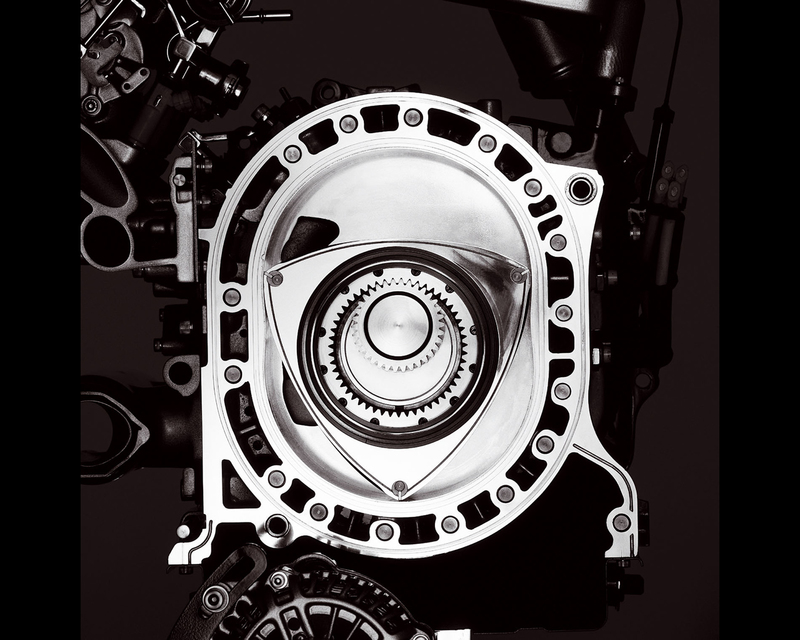 Mazda was the only licensee to pursue with the rotary piston engine, claiming now over forty years experience.